If you have a touch screen device but find drawing pictures with your fingers a bit tricky, this could be the solution, the iCrayon. 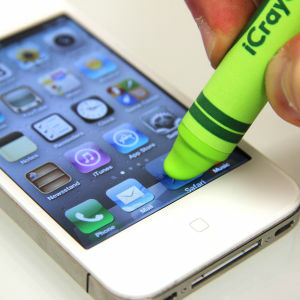 Embrace your inner child and draw or type using the crayon, playing Draw Free with never be the same again. iCrayon has been designed specifically to interact with touchscreen devices e.g. phone, iPod Touch or tablet, and it’ll conduct more effectively than your fingers. It’s perfect for ‘touch typing’ or use it for drawing apps and games, your efforts at drawing will look a lot better and will be easier to guess when playing games. The iCrayon will keep your screen free from grubby fingerprints and it’s also really useful during winter when you’re wearing gloves. The iCrayon is available from iwoot for £7.99 (~$12). Virgin Galactic – Commercial Spaceline, Big Dollars and no Peanuts.